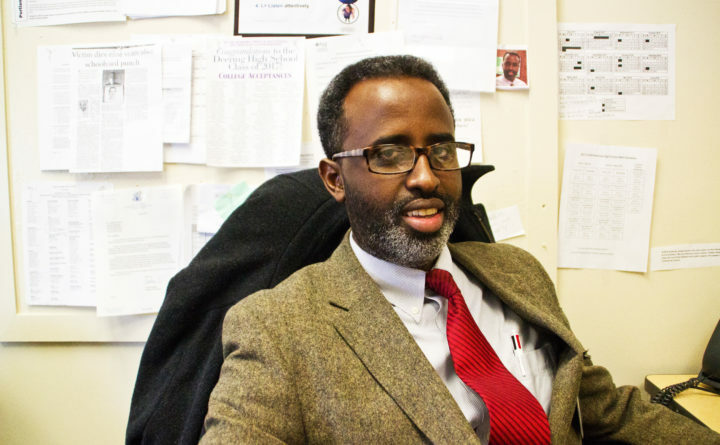 Abdullahi Ahmed, assistant principal at Deering High School, studied ways to create better connections between public school systems and the city's Somali immigrants for his doctoral dissertation at the University of Southern Maine. He continues research in the area, setting his sights next on understanding teachers' perspectives on parent engagement. When Deering High School Assistant Principal Abdullahi Ahmed has a troublesome student, he’ll sometimes reach for a lifeline. “I say, ‘Let’s put your mother on the phone,’ and then things change,” Ahmed said. At Deering, where a mix of different languages bounce through the halls, he has an advantage phoning home: he speaks the school’s three most common languages, English, Somali and Arabic. Research shows higher parent involvement can have major upsides for student performance, but it takes more than a common language. It takes a lot of work. Ahmed would know. He’s spent years on that puzzle, as a teacher and school administrator working to get parents of his own immigrant community more connected to the city’s schools. “I’m very passionate about it,” said Ahmed, who also has a doctoral degree in education from the University of Southern Maine. His 2015 dissertation spells out why. “Like many Somalis, I am concerned that the schooling experiences in my new country do not satisfy my people’s hope: to prepare their children for securing social and economic gains in order to break the cycle of poverty,” he wrote. Education experts elsewhere in Maine share that concern, and they view parent engagement as one strategy for building more support around students who need it most. The benefit can be as simple as having parents, students and their teachers agree on goals for a student, and on strategies to reach those goals based on their specific skills or shortcomings. “Many times, parents won’t have a sense of vision or what’s possible for their child,” said Sue Mackey Andrews, an expert in child and family development and education policy. Ahmed said such efforts come with few added costs for school systems, which is part of the appeal. In March, Ahmed said Portland achieved “ideal parental involvement,” when school officials adopted a policy for parent engagement largely written by parents. But fulfilling those goals is an ongoing project, he said. Some might perceive teachers as authority figures who don’t want input from parents. Beyond unloading such perceptions, they also might face the challenge of picking up others. “Newcomers usually do not have the same background to understand the culturally unspoken rules,” Ahmed wrote. Karen Keim, director of the Maine Educational Opportunity Center, said bridging those kinds of gaps are key to starting any honest and productive relationship with parents. While Ahmed said there’s plenty of work still to be done to bring families closer to the school system in Portland, he and participants in the effort here say there are lessons in the city’s experience. Years ago, teacher and community organizer E’nkul Kanakan got his first job in Portland schools, working as a translator in classrooms and a facilitator with parents with limited English. He began inviting parents to school events, but few showed up. “So, we changed the venues and we went to meet them where they were,” Kanakan said. Portland Empowered, an initiative started five years ago out of USM’s Muskie School of Public Service and funded by the Nellie Mae Foundation, took the lesson and ran with it. To reach communities historically left out of the conversation, they recruited parents with connections to different communities to organize events for their peers. Kanakan, who remains involved with the program, said the approach has led to “little breakthroughs” in the past two years, during which new Mainers and old Mainers crafted a list of priorities for how they wanted to interact with the school system, including a preference for in-person meetings. Ahmed said he couldn’t point to specific ways adoption of the policy has led to increased parent engagement, but the development of the policy itself provided something of a crash course in opening those lines of communication. “The policy and the way it came into existence is the ideal parental involvement,” Ahmed said, where parents went beyond volunteering or helping with homework to change school policy. Having that on the books, he said, gives a clear direction for parents and teachers, and a clear change in tone. The new policy uses the word “family” or “families” a combined 37 times; “community” got nine mentions. The previous policy mentioned each of those words once. Priya Natarajan, a teacher at Casco Bay High School and a parent of a middle school student, said the process in Portland holds a general lesson for school systems everywhere: get the right mix of parents in the room and listen. Portland Empowered found face-to-face interactions between parents and administrators were important, but barriers like access to transportation or inflexible work hours sometimes made that difficult. So, to get parents otherwise left out of such events, they made changes. The events that spawned the group’s parent engagement policy took place on Friday evenings. And for parent leaders organizing the events, they offer a stipend for time where they might otherwise be working. “If it’s hard for them to make the time to be there, then we’re honoring that in some way,” Thielmann said. As a teacher and parent in the school system, Natarajan said better relationships and communication can help students feel more comfortable in class and can give teachers and parents better information about how to support a child. With that kind of information, teachers can better address student needs or childhood traumas that can alter a child’s brain chemistry in ways that disrupt their learning, according to Mackey Andrews.